It’s that time of year again: Chanukah! A time to remember Jews’ suffering during the Greek occupation. A time to remember the Maccabean revolt against the Greeks. A time to remember the miracle of Chanukah. And How do we remember all of this? By lighting the menorah, playing with the dreidel and of course by eating jelly donuts, known in Hebrew as sufganiyot. 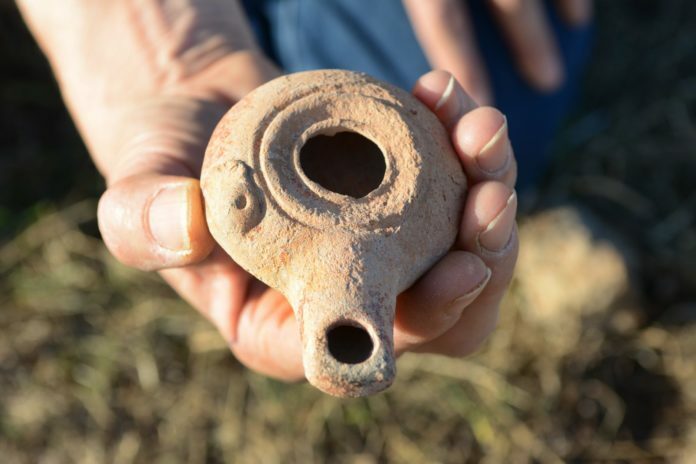 But for 7-year-old Hadas Goldberg-Kedar and her mother, Ayelet, a pre-holiday excursion last week turned into an opportunity to remember Chanukah in a more unique way: During a hike in the Beit She‘an Valley, they discovered an ancient clay candle holder. After looking more closely, the holder turned out to be a well-preserved pottery vessel that dated back to the Hellenistic period at the beginning of the 2nd century BCE – approximately the time that Judah Maccabee led his famous revolt against the the Selucid king, Antiochus Epiphanes. Dr. Einat Ambar-Armon, education and community coordinator for the IAA’s northern region said the candle holder was typical of the period. “During this period, clay candlesticks were produced in formations: the upper and lower parts were produced separately, and were then joined together,” she explained. That new technique “enabled the mass production of candles, as well as the addition of a variety of decorations. In later periods, candles and other Jewish decorations sometimes appeared on the candles,” Ambar-Armon added. She also said that the discovery of the lamp attests to the type of activity that existed in the Beit She’an Valley during the Hellenistic period. Ayelet Goldberg-Kedar, an archeology student at the University of Haifa, said that upon finding the holder, she assumed it had been left behind by antiquities robbers and called Nir Distelfeld, an inspector from the Israel Antiquities Authority Anti-Theft Unit. The culprits, it turned out, were not antiquities robbers; rather, the holder was unearthed by porcupines digging lairs for the winter.